B & C Kennels: Newest Litter of Golden Doodles are now ready for their new homes!!!! Newest Litter of Golden Doodles are now ready for their new homes!!!! Update: 10-2-18. This whole litter has found their new homes. We have two more upcoming litters that will be available starting October 12 and October 19. We are keeping the next two litters at $1500. Check the link to the right for more info and pics. They are as cute as can be. Litter of 8. We still have 6 pups available for their new homes. 3 girls and three boys. 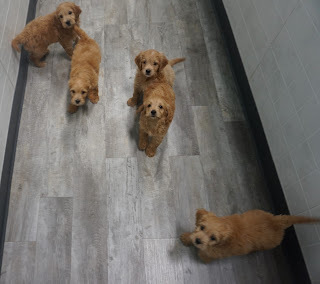 Our usual price for Golden Doodles is $1900 but we have priced this litter at $1500! Great time to get a quality pup at a fantastic price. Mom is a mix between an English Cream and a regular Golden Retriever and dad is a Mini Red poodle. These pups should be in the 25-35# weight range and have little to no shed. Check the link to the right for pictures of all of the pups. These cuties are waiting for you to give them a new home!